You are here: Home / Testimonials / Our Beautiful Positive Caesarean Birth Story! Our Beautiful Positive Caesarean Birth Story! 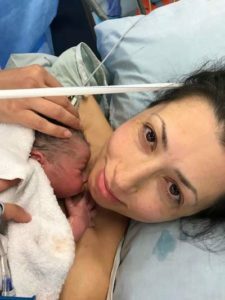 This beautiful birth story was sent to us recently and mum Christina had purchased the ‘Positive Caesarean Birth Online Course’ that included a 90 min Skype session with me. I hope you enjoy reading this birth story as much as I did. Hi Melissa,I just wanted to share with you my joy and happiness from finally having my baby and to express my gratitude to you for giving me the opportunity to have it in the best possible way.The c-section was planned for 13th of September, but my baby decided to come out earlier. My membrane released during the night on 11th of September and we headed to the hospital. Six hours later I cradled bubs in my arms. It was nothing like what I expected. The day before I was full of fear about the surgery and even that I could die and not see my baby.But we all were calm and relaxed, thanks to the tracks. The staff at the hospital not only accepted almost everything on my preference list but said that they are offering most of them anyway. My music was playing during the surgery and I got the baby straight out of my womb thanks to my midwife, who excitedly agreed to support me to do the birthing as natural as possible. The cord clumping was delayed not much but still for some time. It was my back epidural and the cut, no other interventions. I also didn’t feel any pain afterwards.The following night I was up and going. I couldn’t wish for a better outcome after using your course and your encouragement in the phone conversation. Thank you so very much from the bottom of my heart! Thanks a million again and be blessed for what you are doing!